What does Austria look and sound like? And how does it taste? 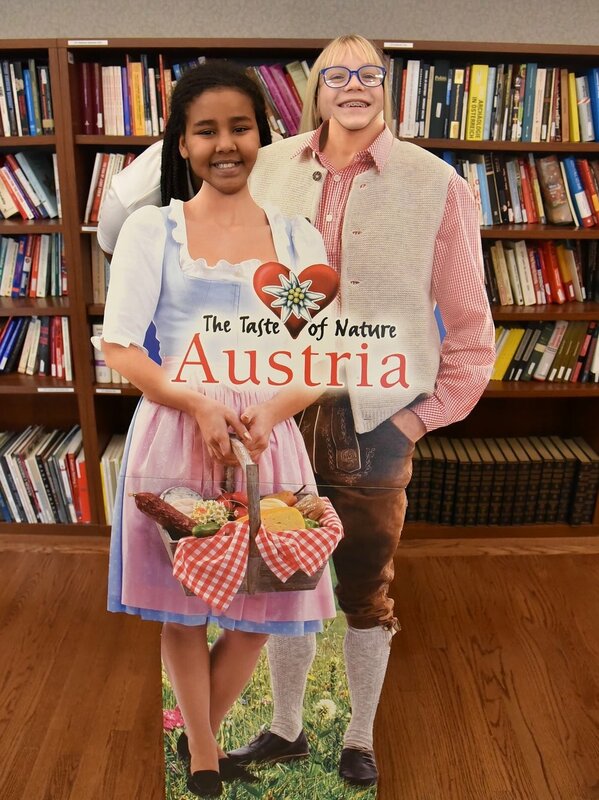 21 fifth-grade students from Ross Elementary School in downtown DC and their teacher Ms. Emily Mulford visited the Embassy of Austria on November 29, 2018, to learn more about their “adopted” country. The topics in our country report ranged from Empress Maria Theresa to Austria’s version of a hot dog stand and its must-try: a sausage filled with cheese (the Käsekrainer). The students got first-hand experiences by listening to contemporary pop like Krautschädl’s “Feiah Fonga” (besides classics like Mozart) and taste-bud-challenging vanilla ice cream topped with Styrian pumpkin seed oil - quite a culinary adventure for them! They learned some German, figured out how the lines of Austria’s borders are shaped and posed for photos in Dirndl and Lederhosen. The Embassy Adoption Program is a partnership between the DC Public Schools and Washington Performing Arts which pairs embassies with fifth and sixth grade classes for a year's worth of cross-cultural learning, projects, and enrichment activities.